David Meerman Scott, marketing strategist, keynote speaker, and bestselling author of 8 books including Newsjacking, joins the Social Pros Podcast this week to discuss the new face of the news cycle, share stories of good and bad newsjacking, and teach you how to employ his techniques to get your brand noticed. Jay: You wrote a blog post right after Sandy that called into question some companies that were trying to sort of use that very specific circumstance to generate disproportionate attention for themselves. As the author of the book Newsjacking — which is a terrific read — you are the namer of that concept, that idea of stepping into a cultural event and trying to use it to your advantage. That can sometimes be overwrought, I think is how that played out in this case. Do you want to illuminate us on that a little bit? David: Yeah. 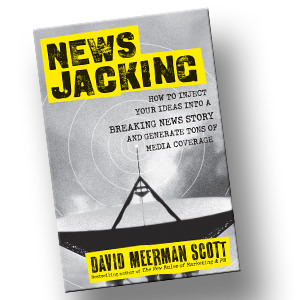 I would say that I didn’t coin the phrase or the term “newsjacking,” but I certainly popularized it because I wrote a book about the topic. Newsjacking, of course, is the art of injecting your ideas into a breaking news story. The reason that it works is because, when a story is breaking in the news, reporters are looking for additional information to add to their stories beyond the basics that everybody already knows. Journalists always will go to Google to just do a search to find out more information as they’re writing. 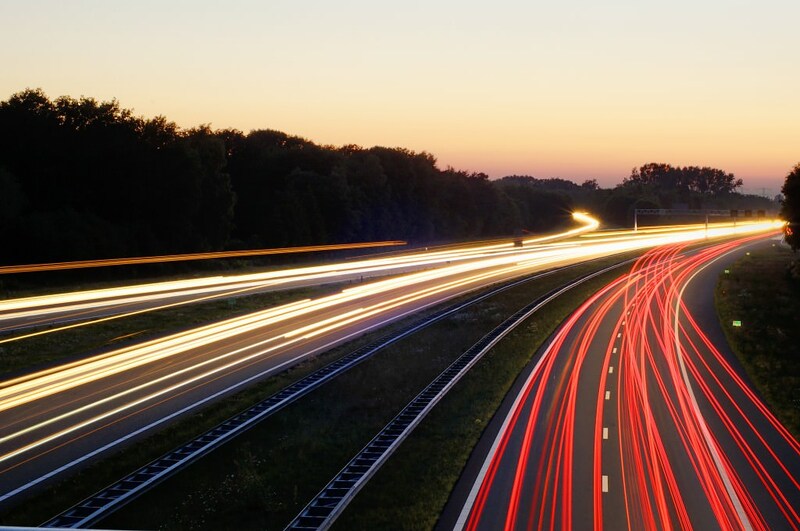 Because Google indexes in real time, if you create a blog post in real time as the news is breaking, it will get indexed instantly, within a second, in Google. If you’re writing very specifically about that breaking news story, then what will happen is the reporters who are searching for information on that news story will find your blog post because you’re likely to have one of the only pieces of information on it, particularly if it’s a very fast breaking story. Then bang, you will frequently get quoted in the press. 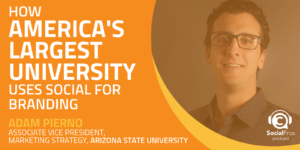 A great example of that in the B2B world is a company called Eloqua. The CEO of Eloqua, a marketing automation software business, noticed that his biggest competitor, a company called Market2Lead, was acquired by Oracle. He wrote a blog post called “Oracle Joins the Party” within about two hours after the announcement hit, and then he made it the next morning into all the news stories on Bloomberg, Business Week, PC World, Information World. As a result of everybody seeing all of his information in these important publications, he actually generated a million dollars worth of new business, because the people who had been existing customers of his competitor thought, well shoot, maybe we don’t want to be a part of this giant software company. Maybe we want to go with the other guys. That’s a long way of saying newsjacking is a really cool way to get your ideas into the market. Now, when Hurricane Sandy came through, it was devastating, clearly. A hundred or more people lost their lives, billions and billions of dollars worth of property damage. Many people lost their homes and all their property, and it was devastating. Some companies very cleverly — and I think rightly — newsjacked in a way that was helpful for people who were victims of the hurricane. 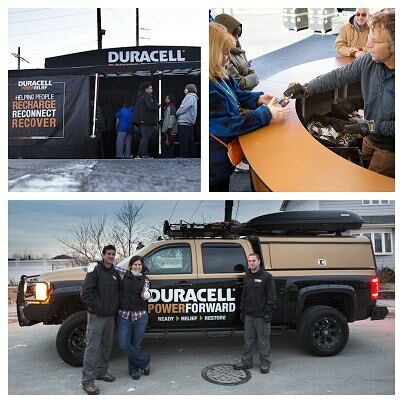 One of my favorite examples is Duracell, the battery company. On their Facebook, they alerted people in the hard hit areas that they were having mobile phone charging stations set up in the worst hit areas. These were basically trucks that came by with multiple hook ups so you could charge your mobile phone, all for free of course. With Duracell, of course, a maker of batteries, it’s perfectly aligned with their business, although it was just about getting their name out there. That was a good example with Sandy.A bad example with Sandy was American Apparel, the clothing company, who puts out messages on social networks and through email that say, “We’re having a 20% off sale because of Hurricane Sandy. If you live in the affected areas, you qualify for 20% off.” Everybody felt that was incredibly insensitive. They were just kind of trying to make money off the hurricane. Jay: Yeah, that’s sort of craven at that point, right? That reminds me of the Kenneth Cole [Twitter train wreck], right? It’s very similar. David: Very, very similar to that. I blogged about the good and the bad of Hurricane Sandy. It’s really tough to newsjack a negative story. Duracell did a brilliant job. Tough, but not impossible. Many times the story that will pop up will be something that’s good or frivolous or whatever and gives you opportunities to newsjack where it’s not fraught with danger the way the negative stories are. I’m like, “Well, no.” It was a problem. Every organization has problems. They did a fantastic job with the communications aspect of it. It was beneficial to me because of my business, of course, being a marketing and communications guy, that I was seen on the front page of the Globe. It works. It’s a great technique. When everybody else is pitching reporters, you’re providing valuable information for them. Eric: Jay and I have talked a lot about virality and the alchemy behind content that goes viral. In your mind, what are the best practices? Is there a 1-2-3 formula of things that companies should think about who want to take this kind of approach? Newsjacking seems to me like a subset of viral marketing. David: I guess you could call newsjacking a subset of viral in that what you’re trying to do is get the media to write about you. The whole point here is that reporters, when there’s a breaking news story, are looking for additional information to put into their stories. They are actively looking for additional information. If you’re armed with that understanding, then your job is to create the information that they’re going to find when they’re looking for more information about a story. The first thing is you need to have a legitimate tie to what’s going on. Jay: So Duracell yes, American Apparel, no. David: Exactly right. 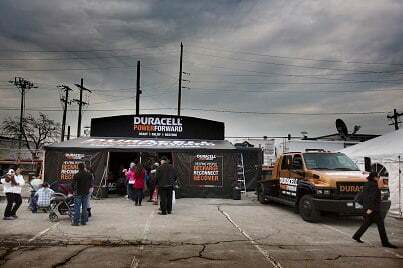 Duracell, yes, because people were without power, and they are a company that makes batteries. So it’s brilliant. American Apparel just, you know, a bit of fashion because there happens to be a hurricane going through, and that doesn’t make any sense at all. You have to be incredibly careful when you’re doing something like that, because to the majority of people, even if you have all the good intention, it’s going to look like you’re exploiting it for your own purposes. So, the first thing is you really do need to have some kind of legitimate tie to the story. 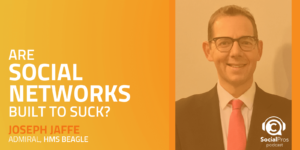 The first example I shared of the CEO of Eloqua having tons of information to share about the marketing automation software industry, which he did on his blog. Perfect news hook and perfect example of an organization that had a legitimate tie to the story. The next thing is you have to be incredibly fast. Tomorrow is not good enough. Even three hours from now is pushing it. You’ve got to drop everything and begin working on your response to that story right this second. It’s like a half life. The longer you wait, the less likely it is that you’re going to be seen by the journalists, because if something is breaking very, very quickly, they’re going to find out about it and instantly and start writing about their stories. A story like Hurricane Sandy is not a true breaking news story in that they were talking about Sandy five or six or seven days before Sandy even reached the shores. Hurricanes are very slow building events. The other thing that a lot of people will try to newsjack are sporting events, or the presidential election was a good example. Those are really tough, because the whole world knows they’re coming. Everyone knows the Super Bowl is coming in, whatever, two months. You can try to newsjack the Super Bowl, but everyone else is trying to newsjack the Super Bowl. The best times to make this technique work is when a story that nobody saw coming breaks right this moment. Two or three times a day, I go to Google News and turn off all the personalization. I’m looking at the raw Google news feed of headlines, and I just look at what’s going on. Is there anything breaking that I have something to say about? Every once in a while I’ll find something, and I’ll blog about it. That’s the second thing. You’ve got to be really, really, really fast. Then, when you create the piece of content for your blog post, although it could be a video or a tweet or something, but typically a blog post, use the right keywords so that that gets indexed by Google and people will find it and the reporters will find it. We can dig into more details, but that’s as easy as it gets. Jay: Do you think that reporters at some point are going to reconsider the speedy nature of this? There was a subsidiary story around Sandy, about all the false photography that went around on Instagram and major media outlets publishing photos that were doctored as if they were real. I don’t think that’s going to abate any. That trend of, “Hey, let me see if I can pull one over on you,” almost false newsjacking, do you think that it’s going to give people pause and, at some point, will say, “Hey, maybe we should be right rather than we should be first”? David: My first job was on a bond trading desk in New York City 25 years ago. The world of bond trading is an instant communications world. You cannot make money at a bond trading desk unless you live and act instantly. That is exactly where the media has gone, and I believe it’s exactly where marketing and public relations is going. We are living in an instant communications environment. We are living in a world where the news cycle is no longer a day, it’s an hour. We’re living in a world that bloggers and sites, like Huffington Post, and the cable news channels and people on Twitter are engaged in instant communications of the likes that we’ve never seen before. In the old days in the world of newspapers, it was completely different from this new world. I believe that’s one reason why the offline media is having trouble. You cannot put this toothpaste back in the tube. It’s up to the silly journalists that published those photos of people in their scuba gear in a subway to figure out if they’re real or not. Jay: It used to always be you have to get two sources, you have to get confirmation. I was a journalism major. That was always the rule, right? You don’t run with anything unless you have two sources. 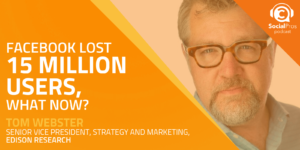 David: Right, and in the bond trading world, if you make too quick a decision on a trade, you can lose a million dollars. In this world, if you make too quick a decision, you can lose your job. We are in a real-time world. We’re not going back, and the smart and clever people who understand techniques like newsjacking can generate incredible publicity for their organizations. But if they do it wrong, they can also end up with a social media shitstorm on their hands. Jay: Love it. Well, you write a book about as often as I finish a sandwich. 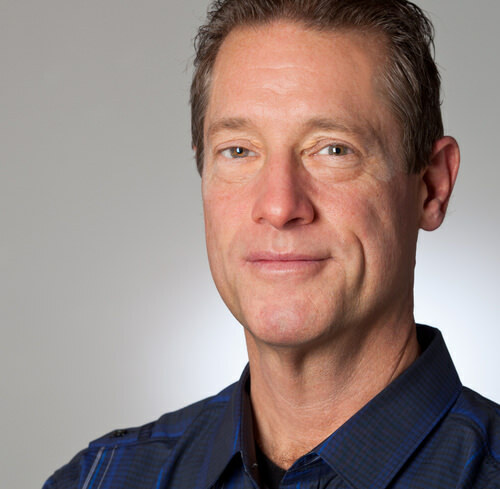 So what is the new David Meerman Scott book that you’re working on right now? David: I’ve written eight books. It’s actually quite remarkable. And if you include the books I’m executive editor on, like Ann Handley’s book and a bunch of others, I’m actually up to 13. If you include the different editions of my books, it’s over 20. 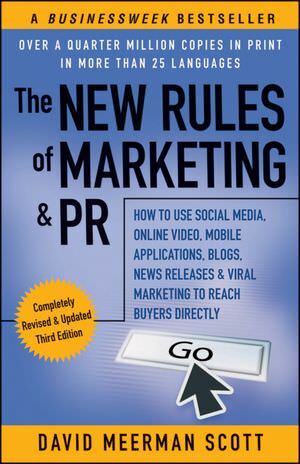 I am working on, believe it or not, the 4th edition of The New Rules of Marketing and PR. That book originally came out in 2007. The 4th edition will come out in the middle of 2013. I’m feverishly putting together new stories that will go into that edition and also writing sections of things that have emerged on the scene in the last about two years. For example, I don’t know what you guys think about Google+, but what is interesting about it is that it’s important for search engine optimization. When you update something to Google+, Google loves you. Whether you’re going to get any engagement or not, I don’t know. It is important to know that Google+ is an important way to get a search result in place. By the way, with the newsjacking technique, it’s also a really interesting way to get the content that reporters might find, because if there’s a breaking news story, even if you don’t have a blog, but you’re on Google+, you can write up a couple paragraphs and put it up there on Google+, and if you’re lucky and you’re clever about the keyword searches, if a reporter enters a similar search, bang. They’ll find you on Google+, and all of the sudden they’re quoting you. Jay: That’s a good idea. I never thought about that, Google+ jacking. There you go. You heard it here on Social Pros. Eric: I thought it might be relevant to have a quick chat about Pinterest considering all of the holiday wish list pinnings that I’m sure are happening across the world. 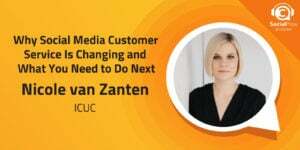 The Social Habit is all about social data and social media behavior, and there is the perception that Pinterest is overwhelmingly used by women. The Social Habit has some data to back that up. The way to look at this is a comparison of who uses social media. Generally speaking, the pies are pretty evenly split up by age and by gender. Social media is a mainstream activity, so of course there’s going to be a wide spread of usage. 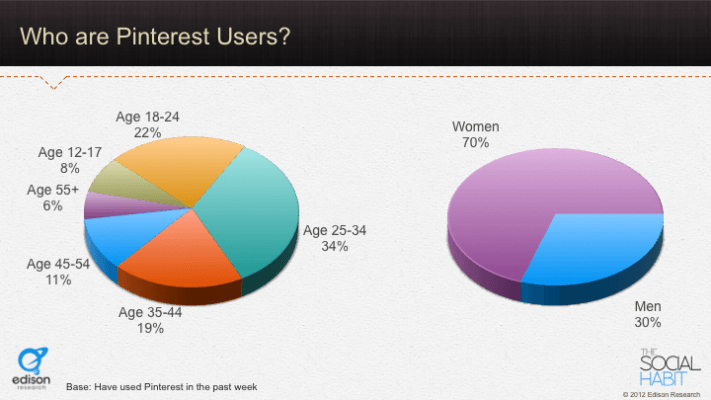 When you look at who uses Pinterest and you compare the pie charts by gender and by age, it’s pretty stark. 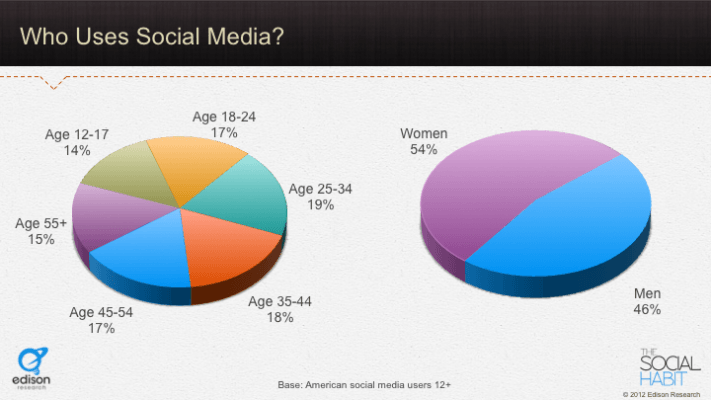 Pinterest is used overwhelmingly by women — 70% — and 55% of the usage is coming with the ages 18 through 34. These data points are interesting to me because it’s a very clear case for special casing your approach to Pinterest based on this type of information when you compare that to what you might be getting on Facebook and Twitter in terms of your demographics. Jay: I wonder if at some point you have fewer people using things like Amazon Wish List and more people using Pinterest for that function. 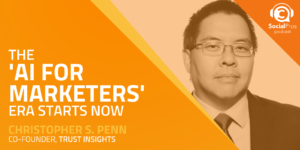 Eric: I think if Pinterest can get their act together from a commerce perspective, maybe so. I mean the mainstream thought has been for a while that commerce will be the great monetization opportunity for Pinterest. If there’s a way to quickly transact by way of a Pinterest wish list, then that can make a ton of sense. Jay: David, give us a couple of your Social Pros shout outs if you would please. People out there in the world of social media who inspire you who do not get the attention they so richly deserve. David: I’ve got a couple. One is a hotel in the western part of Belize. It’s called The Lodge at Chaa Creek. I love them because they’ve used social to become the number one search term in the entire country of Belize, and they’re just a little dinky hotel. So I love them. Jay: I’m almost positive that’s the first Belize hotel we’ve had mentioned on the show. I’ll have to check the transcripts, but I’m almost positive. David: It’s totally worth looking at. I also am a fan of Remco Janssen, and he’s out of the Netherlands. He’s in Amsterdam. He blogs at RemcoJanssen.com. He’s just got a very, very interesting and clever outlook on the whole social world. I’m an internationalist. I’ve spoken in 34 countries. I actually just today booked a gig in Cairo, Egypt. Last week I was in Bulgaria. So I like international examples of social media success. Remco is a good example. He’s really very, very clever about what he does in social. My final example is the Kolkata Traffic Police on Facebook. Yes, yes, yes. In Kolkata, India, of course. 26,704 people like them. How crazy is that? The reason is because you can actually ping the Kolkata Traffic Police on their Facebook when you’ve had a problem that they can help solve. One of the ways that people are using it in social is if you’re riding in a taxi cab and he rips you off, you just snap a picture of the driver and the meter, and then you reach out to the Kolkata Traffic Police on Facebook, and they’ll solve the problem for you and get your money back. It’s pretty clever. Jay: That is terrific. I love it. Eric: Coolest Social Pros shout outs yet. Jay: David, thanks very much for joining us on Social Pros. We really appreciate your time and your expertise. Mr. Boggs, who is on next week’s episode of the program? Eric: Next week, Lisa Joy Rosner from NetBase. Jay: Fantastic. In fact, I just put out an e-book with them this week: Use Conversation Mining + Facebook Data to Thump Your Competition. So we’ll talk about that, I’m sure, and other stuff they’re doing in the world of natural language processing. Until then, thanks everybody.